Last Tuesday, two friends and I decided to venture out into Carlisle to try some new local beers. 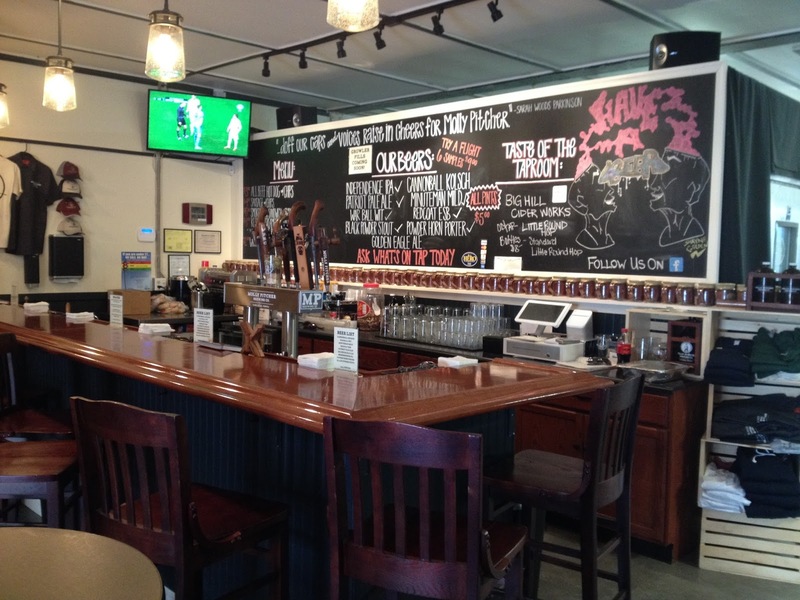 We found ourselves sitting in the taproom of the new microbrewery, Molly Pitcher Brewing Company, sipping on their ever-developing range of beers. As the taproom expands in both hours and options, Molly Pitcher is becoming an increasingly desirable place to relax with a local beer. Molly Pitcher is truly a local microbrewery, drawing its name and inspirations from the local Revolutionary War hero, Molly Pitcher, who is buried in the cemetery next door. Entering the taproom through the small door next to the garage where beer pickups occur, we walked into a sleek taproom that was surrounded by fermentation tanks brewing the beer, and several decorations that harken back to the Revolutionary days of Molly Pitcher. The taps were all topped with pistol tap handles, and hand drawn art covered a wall-sized chalkboard menu behind the bar. We were quickly seated at one of their high top table at the edge of the taproom where a small wall divides the seating area from the brewery itself. We perused the menu of beers on tap, all named after the American Revolution. Unable to decide from the variety of Molly Pitcher brews, we opted for a flight of beers ($9). The flight of 6 beers, each in a five ounce glass, presented a nice mix of Molly Pitcher’s brews. We got a variety of beers, from the Redcoat ESB, an English style beer named after the hated British soldiers, to the Independence IPA, a hoppy IPA that was perfect for the week after the 4th of July. As a local microbrewery, there was a very developed variety of tastes in the beers, and a beer for most palates. 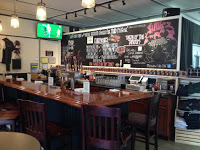 All of the beers are exclusively Molly Pitcher Brews, but there are also options for Wine by the Glass from Knob Hall Winery, as well as cider from Big Hill Ciderworks. There is also limited bar food in the taproom, but most of the focus is on the beers. As Molly Pitcher continues to develop its range of beers and refines its taste, it will continue to grow as a popular brewery in Carlisle. With hopes to begin selling beer in Growlers and beyond the taproom, Molly Pitcher will soon be a fixture in most Carlisle homes, and we look forward to returning to the taproom and having more flights soon. Ben is a Senior at Dickinson College, studying Economics and Political Science. Originally from Boston, MA, Ben came to Dickinson to live in a small college town, and has come to appreciate everything that Carlisle has to offer. He is a Student Tour Guide and serves on the Cabinet of the Dickinson College Student Senate. His passions revolve around playing trombone and jazz music, supporting his hometown Boston Red Sox, and spending quality time with his friends around campus and Carlisle.